World Famous Comics' Michonne Bourriague Website - Appearances schedule, Aurra Sing and Star Wars links, photos, and more! Aurra Sing in Star Wars: Episode I - The Phantom Menace. Pick up some autographed items from the official Michonne Bourriague Store! US based online credit card orders are shipped 2-3 day USPS Priority Mail the next business day! List is tentative and subject to change. Michonne Bourriague has been a model for the past five years who, early in her career, had George Lucas cast her in Star Wars: Episode I - The Phantom Menace as the fearsome bounty hunter, Aurra Sing. George Lucas said to her on the set, "I'm going to make a star out of you in three seconds." And he did. Despite her short screen time, Aurra Sing, is now one of the Star Wars Expanded Universe's most popular bounty hunters and can be seen starring in the Star Wars books and comics. Enjoying her new found fame as one of the galaxy's most popular and feared bounty hunters, Michonne has made appearances all over the world to meet Star Wars fans. She says, "I feel very fortunate to have had such wonderful experiences so early in my career. It has been an amazing three years and I look forward to many more as I continue to work hard at pursuing success in the industry." Currently, Michonne lives in California focusing her attention on young teens. "I'm instructing six week workshops called Self Esteem for Teens. We teach modeling techniques and at the same time demystify the industry and focus more on inner beauty and self esteem. It's awesome to share my experience and at the same time give back to the community." Star Wars: The Hunt for Aurra Sing - Graphic novel starring Aurra Sing. Aurra Sing: Dawn of the Bounty Hunters - A Star Wars Masterpiece Edition. 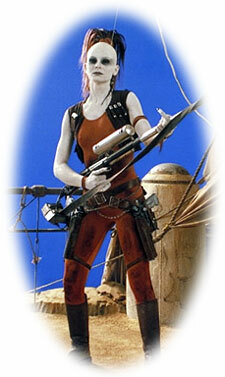 Star Wars: Demolition - Play as Aurra Sing on your Playstation, Playstation2 or Dreamcast. Star Wars Movies (DVD) - Buy Star Wars films on DVD. Star Wars Movies (VHS) - Buy Star Wars films on VHS. Star Wars Toys - Buy Star Wars action figures and more.